Yesterday was hot and muggy. My big chore for the day was watering and feeding the garden. We have poor soils, so initially, as we build the soils with organic materials, we are also fertilizing with a ground, whole-fish mixture. It’s a messy venture, with mixing in 5 gallon buckets and then pouring back into a watering can–or, for the fruit trees, into our special, slow-feed (cracked-bottom) bucket. Just watering is an exhausting exercise in hose dragging (three hundred feet of heavy duty hose to three locations) and the alchemist’s fertilizing concoction stinks. It splashes all over –and, in the heat, red-faced and sweating, I was quite a sight (and smell) even from a distance. Our neighbor happened by. She’d been hiking up in our hills. We haven’t seen each other in weeks and she stopped to catch up. The whole neighborhood is in a tizzy over the loose and barking dogs. So far, nobody has the nerve to press the sheriff to do something about them; that day is coming. The barking, especially late at night, is driving everyone crazy. I’m always surprised that people aren’t more direct. We exchange stories. She’s kind enough not to mention my fishy, disheveled state. But, she seemed a little more agitated than just the usual barking dogs annoyance. She nodded, then wrinkled her face, obviously dissatisfied with my response. She leaned forward, almost conspiratorially, “No, really, you should get back there. 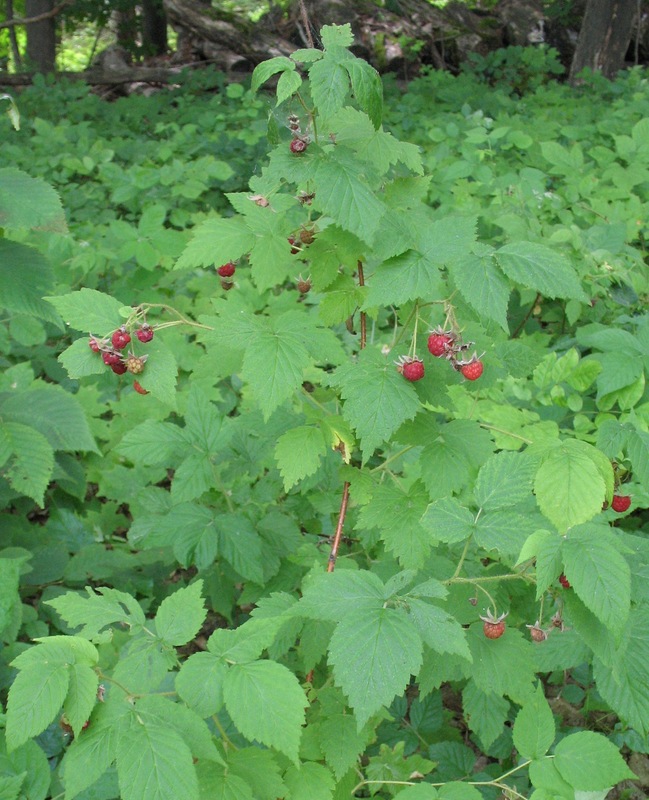 They’re ripe…really lovely.” And then she repeated, lowering her voice, “There are raspberries in the woods.” I thanked her and she headed home, disappearing through the pines. I was pretty spent from my morning’s chores. The woods are cooler and the suggestion to pick berries was stuck in my head. Fresh raspberries… I could make sorbet. Wouldn’t that be lovely on a hot, sticky day? And, it’s been weeks since I walked in the woods. There are raspberries in many parts of the back-forty. Marilyn hadn’t been specific about which area got her so excited. So, I ambled west, down the south side of the two-track, figuring that if I didn’t find anything I’d cut north before it got too steep. It was lovely, a light breeze and a near full canopy of shade. 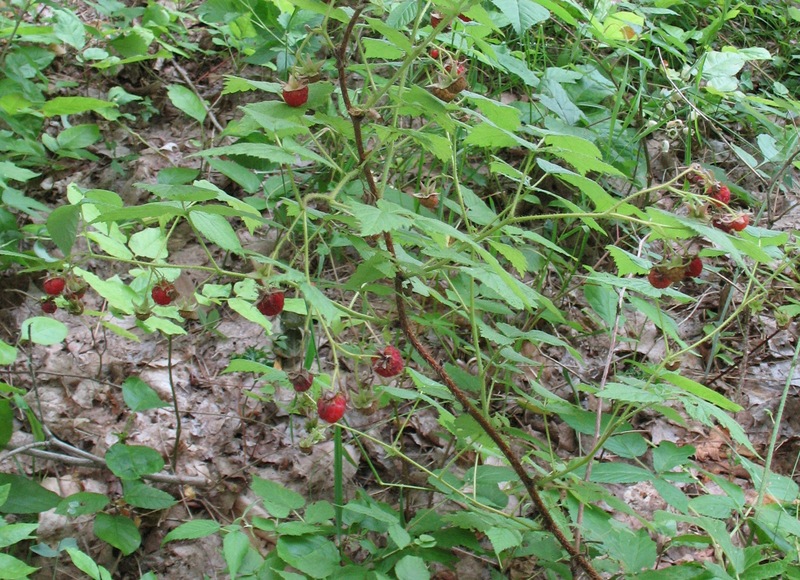 I found plenty of berry canes, but the berries were not ripe in the shaded areas. I headed up the hill, hoping they’d be further along in the sun, up on the ridge. I crested the top and saw red berries almost immediately in what had become a jungle of brambles since I was last there. Just as I turned to find the trail, I came upon three teenage girls who were taking turns cutting a log with a bow saw. I was stunned. So were they. By now, the girls were looking a little nervous. They stood up and brushed themselves off. “Perhaps you should take me to your leader,” I smiled. They didn’t get the joke. Maybe it’s too old. Maybe I’m too old. They led me, single file, down the trail to where it widens along the ridgeline. We came to a campsite with about a dozen tents. The trails were neatly swept clean of leaf litter. There were “furnishings” made from cut logs, tied together with heavy twine: a big dining table; log stools; and storage shelves full of packs, tied, shoulder high, between trees. A combination tent/lean-to held coolers, half buried in the ground. Everywhere around me, young teens were busy, working together to establish camp. I was taking note that they seemed well organized, and supervised. It almost felt like another world had sprung up in our woods, like they were playing house there, with their swept trails, neat lines of tents and twined furniture. But it wasn’t lost on me that they were cutting quite a bit of wood. Most of it looked like deadfall. I am sensitive to people cutting wood on the property. The other two girls ran ahead to find their counselor. The blond stayed with me, as she narrated what the campers were doing. Her companions came back, with another girl, just a couple of years older. “Okay, maybe you should take me to your leader.” She didn’t smile. So, the counselor, the blond, whose name was Emily, and I began the hike over to the meeting. I guess since Emily found me, she became a permanent part of the entourage. The counselor asked me to let her know when we were no longer on my property. We hiked for some time and then I told her that we were at the property line. We still had some ways to go before we reached the “headquarters.” At one point, we ran into some other campers, the counselor stopped to ask where the meeting was being held–and then directed Emily to take me there. We proceeded down the trail, with Emily in the lead chatting about the camp and what they did. In the distance, we could see a group of women, sitting in a circle next to a van. As we approached them I informed Emily that once we’d arrived, it would be inappropriate for her to stay–that my business and concerns were with those in charge. She paused and then told me that she would leave, but first she needed to introduce me. I found that to be charming, especially under difficult circumstances. Finally, I was introduced to the woman in charge of the camping operation. She explained that they leased the camping area from the owner–and gave the name of my neighbor, to the north. She believed that they were on his property, but if that was not the case, it was a mistake. I told her that the camp I had first encountered was on my property, and not by just a little. It was located about two thirds of the way into our back forty. She apologized and added that they were, after all, a Christian Youth Organization, dedicated to teaching wilderness camping to young men and women. I couldn’t help but say that one of the first wilderness lessons was about knowing how to read a compass and a map, and it appeared that the leadership of this group had failed miserably at this threshold skill. I explained that I was angry–not specifically at her, and I didn’t want to direct my anger at someone who wasn’t personally responsible. I said that I also wasn’t crazy about the fact that the girls were cutting wood on my property. I drew her a map, showing her where the property line was, and gave her my contact information, so the Director could reach me to iron this out. Then, I headed back down to our building site to tell Rick. He could barely believe it. But, it did begin to make some sense. For those of you who follow this blog, you know we’ve had problems with woodcutting. All of the cut logs we’d found, it didn’t make sense. But now–now that we had “competitive camping” on the property, it made all the sense in the world. At no point in the thick of it did I stop to consider what impression I may have made. There I was, dressed in grubby construction clothes, red-faced, drenched in sweat, and smelling strongly of fish. I can only wonder what they all thought. When Rick and I re-visited the campsite, there wasn’t a trace of them. Even the leaf litter had been re-spread, carefully and evenly, over the trails and their site. The only reminder was an impressive pile of cut wood–which they’d said they’d leave. We’re trying to work out “compensation” for the use now–something in the vein of some volunteers, next Spring, to help with tree planting. We’ll make it fun and educational–maybe we can help some young people to get involved in understanding why we plant for the future and for forest diversity. I think it will all work out in a win-win kind of way. But we’re left wondering about my neighbor. Why couldn’t she just tell me we had a camping invasion? What’s up with speaking in code? Now, Rick gets a glint in his eye and whispers, “There are raspberries in the woods.” I have to laugh. And, those Christians? I can only hope that they can forgive us our trespasses, as we forgive those who trespass against us. And, at the end of this adventure, I realized that I’d completely forgotten to pick berries.